Animal Crossing Pocket Camp leak, datamine, the latest news. [Dec 19] New features leaked! Credited to SenorDeeebs and #bluesun#4182 on ACPC subreddit discord! -Addition of garden plot to campsite, to the left of the camper. Check the link here for guides on gardening! Animal Crossing: Pocket Camp now features an integrated screenshot function. The upper right sidebar will have a camera icon which can be tapped to make a screenshot. Screenshots can only be taken inside your campsite or your camper. Screenshots that are not saved nor shared are immediately lost. -When you enter camp, animal friends that want to talk to you will be shown in a thought cloud above your character. -Only the animal friends shown in that notification can be talked to for items and friendship points. -Items gained from talking to animal friends in the campsite have been increased to offset the lower number of animals you can talk to. For players affected by the holiday event issue from 11/30/2017 at 14:00 to 12/4/2017 at 13:10 where holiday challenges were not designated completed even when the conditions were fulfilled, the issue has been fixed and compensation items have been sent. Friend Frenzy event limited timed goals went live on december 10, 2017. There are 3 goals, each one requiring you to add an increasing number of other players to your friends list than before from 1 to 10 to 20. Luckily, the counter for each goal is dependent on your current number of friends. So if you already have the necessary number of friends then the corresponding goal and any lower goal is automatically cleared. You can gain 10, 20 and 30 Leaf Tickets respectively per goal. In game notifications specifically mentioned the gardening mechanic along with the promotion of adding friends to your list. Whether this is only thematic or not remains to be seen but it seems to suggest asking friends for help might be a mechanic of gardening much like with Shovel strike Quarry. Clothes will soon be craftable. Update will possibly release alongside the gardening update. Clothes Crafting is implied to be handled by the Able Sisters instead of Cyrus. Additional info will be added as news comes in. Today on their Twitter page, Animal Crossing Pocket Camp just sent out a tweet hinting at a new location for our camper friends. The tweet shows a photo of a new location with some flowers of varying colors and types through the perception of Shovelstrike Quarry host, Lloyd. 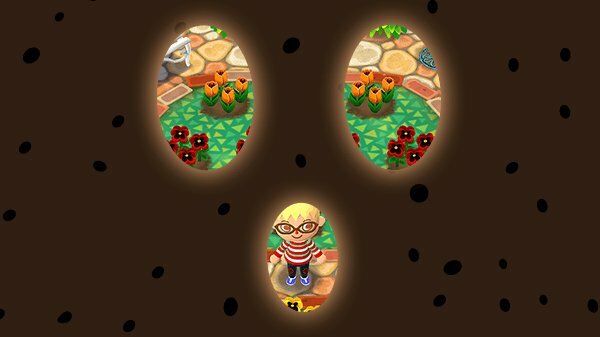 It appears to be that players may be able to decorate and express themselves further through one of Animal Crossing’s features, the Flower Garden. Animal Crossing Pocket Camp Christmas event has officially been announced! It's time to get event exclusive furniture & items! Here are some leaked infos which were shared by SenorDeeebs and #bluesun#4182 on ACPC subreddit discord. That hot air balloon is so lit! i want one!